BHP Infrastructure announces the introduction of the Rubblemaster TS3600 track mounted screening plant on behalf of HMH Engineering GmbH of Austria. We are proud to inform you that we manufacture the TS3600 for HMH at our factory in Faridabad and have begun deliveries to overseas markets and in India. The revolutionary design of the TS3600 enables high screening efficiencies in a diesel/electric plant that has low operating costs and high reliability. The expected diesel consumption is less than 8 litres per hour under full load. Weighing just 15.5 tonnes and powered by a 41.5 kW Deutz engine this versatile tracked screening plant is capable of throughput up to 200 tonnes per hour depending on material and moisture. The TS3600 is ready for action within 10 minutes. The track gear is radio-controlled and can be operated by one person. The angle of the screen box can be adjusted hydraulically which is extremely useful in critical applications and with very fine material. 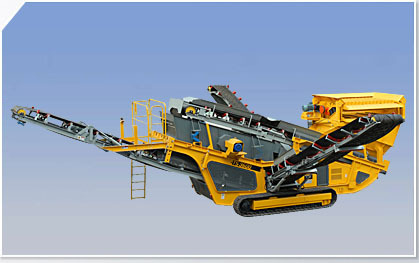 The long discharge belts with hydraulically-adjustable angles provide high material heaps. Maintenance accessibility from the ground and rapidly interchangeable screen meshes ensure no time is lost between jobs. The TS3600 is offered in India with a double deck vibrating grid as standard, enabling the production of three sized products from this versatile screening plant.